The New Canaan library in Connecticut has been auctioning collectible books on eBay as part of its annual Spring book sale being held this weekend, June 6 – Sunday, June 8, 2014. Auction winners can pick up their books when they come to the library’s book sale. See what books are left for auction at New Canaan Library Auctioning Collectible Books on eBay. 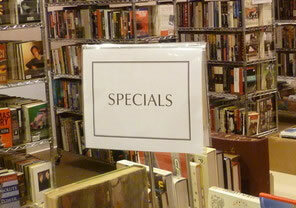 The New Canaan book sale begins in the Adrian Lamb Room on Friday, June 6, from 9 a.m. to 5 p.m. There is a $15 charge to enter from 9 to 11 a.m. Numbers will be assigned at 8 a.m.
• Saturday, June 7, from 9 a.m. to 5 p.m. • Sunday, June 8, from noon to 4 p.m. All books are $5 a bag on Sunday. Funds raised will supplement the funds received by the library from the Town of New Canaan and private donations. The support allows the library to continue offering its wide range of services. Visit newcanaanlibrary.org or call 203-594-5003.